Sometimes I don't know what's wrong with me. I've been aware of Down And Outs for years and have always liked what I heard. But for whatever dumb reason, I've never bought any of their albums. None of them. I could try to justify that by saying they were usually imports, costly postage, blah blah blah, but let's be honest. I've just been stupid. Sure, I have one split 7" of theirs, but to not own any of their full lengths...I have no excuse for that. 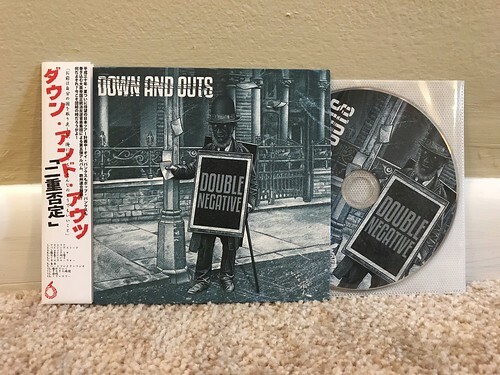 This stupidly kicked me square in the face when Kazu from Waterslide records sent me the CD version of Double Negative. It's so damn great. It's UK punk rock that shows a debt to Stiff Little Fingers and Leatherface, but also has so much in common with the Swedish band Smalltown. The way Down And Outs combine their working class lyrics, melodic punk rock and catchy hooks is pretty much perfect and for the life of me I can't figure out what I don't have more of their records. I need this record on vinyl. And the rest of their records on vinyl. I'm still paying off plumbing bills and other crazy house expenses, but once I get my finances back in order, getting my hands on some more Down And Outs records is at the top of my to do list.